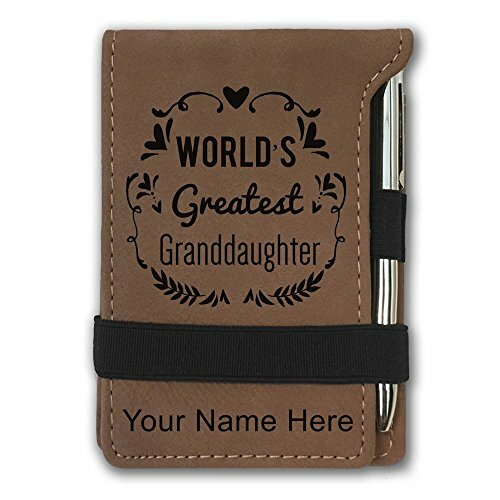 Personalized Faux Leather Pocket Notepad that is laser engraved with the image that you see in the photo. Your name or personalized text will be laser engraved onto the notepad for free. Click the "Customize Now" button to begin customizing your order. The notepad is laser engraved with the image that you see in the photo. We will laser engrave your name or custom text below the image for free. Small enough to fit in your pocket, the notepad measures 3.25 inches wide and 4.5 inches long. Made of synthetic leather and includes an elastic strap to keep the notepad closed when not in use. Includes a miniature ballpoint pen and 50 sheets of blank paper. Click the "Customize Now" button to begin customizing your notepad. View More In Travel Portfolios.